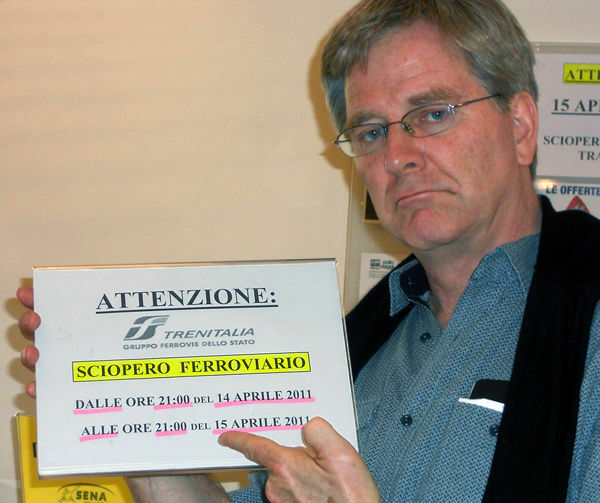 In Italy, look for signs warning of a "sciopero," usually posted at least a few days in advance. The threat of a strike often alarms travelers on a tight itinerary, and many worry about getting stranded somewhere because of a strike. But in general, they're nothing to stress about. Strikes can affect rail service, transit, taxis, and museum openings anywhere in Europe (especially in France and Italy). They're usually announced long in advance. In train stations, look for signs saying sciopero (Italian), grève (French), apergia (or απεργία — Greek), Streik (German), or huelga (Spanish). Though they may be more frequent in Europe than in the US, they also tend to be much shorter. Most last a day, or even just several hours. Anticipate strikes — ask your hotelier, talk to locals, look for signs, check online — but don't feel bullied by them. In theory, train service shuts down during rail strikes, but in reality, at least some "essential service" is preserved, with anywhere from 20 to 80 percent of trains affected. If a rail strike occurs on your travel day, check the relevant national railway website — special strike schedules are generally posted, and many railway sites have pages dedicated to updates on traffic disruptions (such as those for Italy's Trenitalia, Britain's National Rail, and France's SNCF; Germany's Deutsche Bahn site lets you check for delays for any train number). Otherwise, head to the station, where the few remaining station personnel can tell you the expected schedule. You'll likely find a workable train or bus to your destination, though it may leave earlier or later than normally scheduled. If your train is cancelled, your reserved-seat ticket will likely be accepted on any similar train running that day (but you won't have a seat assignment), and should be exchangeable without penalty ahead of the departure time, or can be refunded (have an agent mark it "unused," and check refund deadlines). A rail pass works on any train operating, but partially used rail passes can't be refunded — so make full use of any pass you have to continue your trip. For the Back Door traveler, strikes can even be a cultural experience. On one visit to Marseille, I was surrounded by thousands of strikers marching through the streets. It was a festive occasion. The museums were closed, so I explored the markets and enjoyed photographing striking parents — children rode on their shoulders and learned firsthand what labor action is all about.